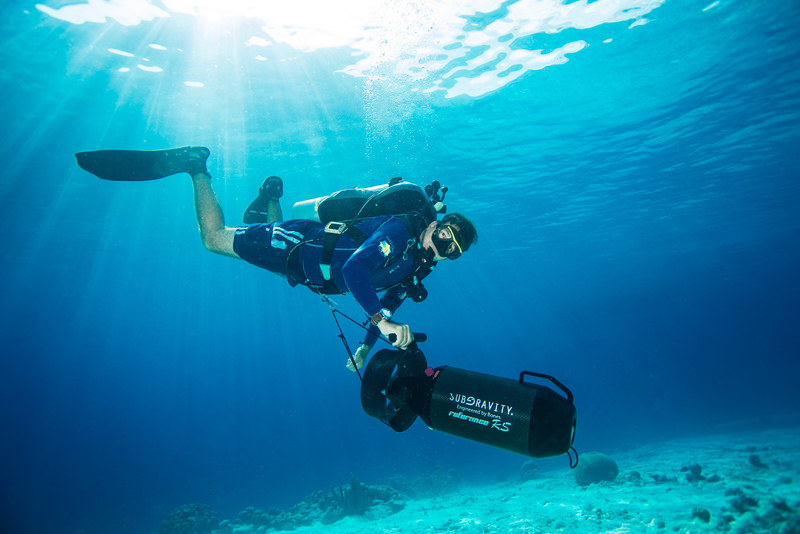 New Underwater Scooters at Buddy Dive Resort Bonaire | Dive Industry Association, Inc.
BONAIRE, Dutch Caribbean (December 1, 2016) – Buddy Dive Resort Bonaire is proud to announce their latest acquisition. As the first and only dive operation in Bonaire, Buddy Dive Resort recently started to rent Dive Propulsion Vehicles (DPV’s), also known as underwater scooters. DPV’s offer a thrilling way for scuba divers to see a lot of underwater territory in a short amount of time. The resort rents the most advanced DPV’s on the market: SubGravity DPV’s, engineered by Bonex. “They are all about high performance and reliability in a compact package”, states German Arango, Buddy Dive TeK coordinator. Simple operation as well as easy handling, makes diving safer and more enjoyable. The scooter allows divers to glide over reefs or buzz around in a large wreck. Whether making a shore or boat dive, a DPV is a great way to see more and have fun doing it. In order for divers to be able to use the underwater scooters, Buddy Dive also offers DPV classes. If you’re at least 12 years old and a PADI (Junior) Open Water Diver or higher, you can enroll the PADI Diver Propulsion Vehicle course. This class is for both recreational and technical divers and will take one full day. The diver will learn about maintaining a DPV, handling skills and how to plan dives with an underwater scooter. During this year’s Buddy Dive TeK event (October 8 – October 14, 2016) the guests were already offered the opportunity to learn more about SubGravity DPV’s. “We welcomed divers from around the world. It was great to see CCR and OC divers from the USA, Brasil, Argentina, Canada, Germany, Belgium, Holland, France and England diving together and sharing experiences”, says Arango. Next to demo’s from SubGravity DPV’s and CCR’s, Buddy Dive welcomed equipment manufacturers and instructor trainers from NAUI, GUE, TDI and PADI, HOLLIS, Halcyon and apDiving. Recreational divers had the opportunity to learn more about tech diving, plus they had the chance to try the latest of equipment while getting instructions from some of the best instructor trainers. Arango: “We can’t wait until next year to do it again and invite everyone from the technical diving community to Bonaire and Buddy Dive.” Bonaire TeK 2017 will take place from October 7 till October 14. This entry was posted in Dive Equipment, Press Release, Travel Destinations. Bookmark the permalink.